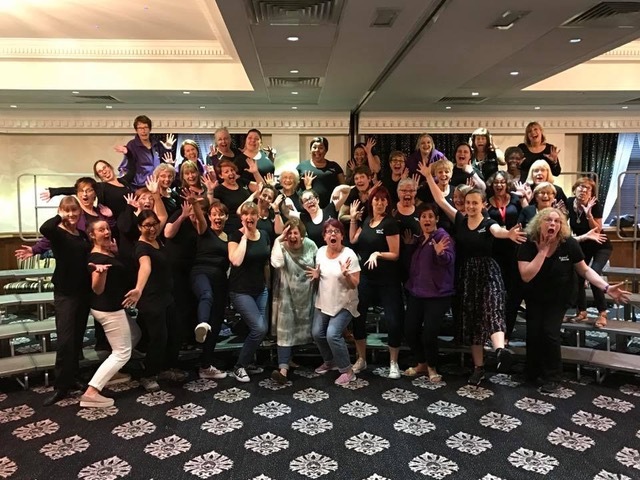 The weekend of 9th and 10th of September was a fun filled, action packed retreat for the Crystals as we headed to Leyland for our annual intensive weekend of rehearsals. Lead by the formidable Sally McLean, we emoted our ballad and sweated through our ‘uppie’ (well the front row anyway!) for two days, honing in on an exciting convention package. And as if that wasn’t enough, we partied on Saturday night with the fancy dress theme of the ‘weather' or 'fame and fortune.’ There is photographic evidence of this, but it has been locked in the Crystal Chords vault of photos not fit for public consumption! Instead, you can see the morning after the night before. Don’t we look triumphant?